(Allow at least 1½ days, including a final baking period of 3 hours.) 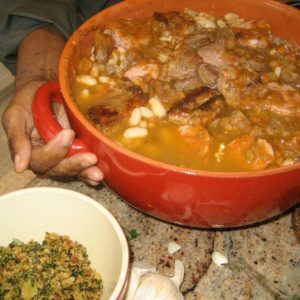 Cassoulet gets its name from the casserole, the large earthenware pot it is cooked in. I was first introduced to it when I was invited to a party by my friend Sally Darr, former chef/owner, with her husband John, of La Tulipe in New York City (1979-1991). Out of her kitchen she came carrying a large clay pot, one she had bought in France, especially made for cooking cassoulet. It was bubbling around the edges and topped with several pieces of crispy confit of duck on a bed of toasted, seasoned breadcrumbs. As the aromas of garlic and braised meats filled the room, I was hooked. There are many variations of this French classic. This is mine. To prepare lamb: Season the lamb liberally with salt and pepper and dust with flour. Melt fat in heavy saucepan and brown lamb in batches. Remove from pan, set aside. In same pan, add a little more fat. Add the onion, carrot and celery. Sauté until vegetables wilt and start to color. Add the garlic; cook for 1 to 2 minutes. Stir in wine and tomato puree. Simmer for another minute or two. Add stock, tomatoes, bay leaves and rosemary, and simmer, covered, for 1½ hours. Cool and refrigerate until ready to use in cassoulet the next day. To prepare beans: Soak the beans overnight in cold water or use quick-soaking method. Drain the beans and place in a large 8-quart pan with 4 quarts water. Add bouquet garni, bacon and garlic sausage and bring to a boil, then reduce to a simmer. Remove sausage after 30 minutes, cool, remove casing and cut into ½–inch slices. Continue cooking the beans until tender, about 45 to 60 minutes longer. Drain beans, reserving liquid. To finish cassoulet: While beans are cooking, brown pork belly in rendered fat. Remove from skillet. Put lamb mixture and pork belly into the pot in which beans were cooked. Heat just until soft enough to break apart. Season 4-quart casserole by rubbing it with garlic. To assemble the dish, begin by spreading half the beans in the bottom of the casserole dish. Top with half the sausage slices, then half of the lamb-pork mixture. Repeat with remaining beans, sausage, and lamb-pork mixture. Add about one-half cup of bean liquor (or as much as needed) to moisten. Top with one-third of breadcrumbs, and drizzle with more rendered fat. Bake for one hour, or until crumb topping is golden and crusty. Stir crumbs into dish. Add another third of breadcrumbs, drizzling with more fat. Bake another hour, or until this topping is also golden and crusty. Stir topping back into dish and add last third of breadcrumbs, drizzling with fat. Bake for final hour.